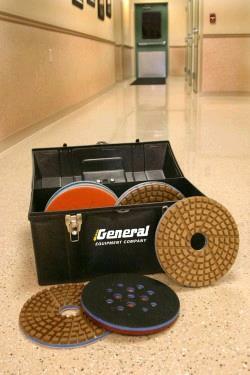 CONCRETE POLISHING KIT GENERAL 12"
The12" Pro Polish System is a simple and cost affordable solution to many concrete polishing applications. Use with 12" General Concrete grinder to produce high quality polished concrete surfaces. The Pro Polish system utilizes a series of seven 12" diamond discs that are color coded to simplify the progression from one disc to the next. Users need only to follow the pad color sequence until the desired results are obtained. Polishing discs in set are 50, 100, 200, 400, 800, 1500 & 3000 grit. Husqvarna GM3000 grout is effective for patching and filling air pockets/pin holes. Husqvarna Hiperhard will increase surface hardness & create a crystalline/glassy structure for gloss,abrasion resistance and greatly affects the final appearance of the floor. Note: Concrete polishing is a very time consuming project requiring many hours and great patience to properly complete each step required for high quality polished surfaces. * Please call us for any questions on our concrete polishing kit general 12 inch rentals in Portland OR, Gresham OR, Milwaukee OR, and surrounding metro area.